Now that , that is out the way lets get to the nitty gritty. Birthday goal weight: I have not put in much effort. My motivation fizzled off around day 10. Actually I am 10lbs up, I could have lied and said I made it to my goal weight but that would make me a big liar and I just rather share with your guys the TRUTH. How sad but It’s my birthday YAY 12/19 ! But no worries you know its an ongoing goal. On a good note, I was able to fit into my November Goals dress and it was cute. Check out picture. Did I nail it or not? Writing for a blog/magazine goal: I have decided what three magazines and or blogs I will pitch to. I actually decided on going all out with this so I will definitely share the end results, if and whenever they come. I have to admit I BIT OFF MORE THAN I COULD CHEW with this goal because pitching to a blog/magazine is a process that needs DEDICATED time and effort but of course I am always up for a challenge ( I WILL WRITE a blog about this process for all my authors/writers out there) there is an art to pitching a story/blog post and I will share my experience at a later date. More New Stuff? This blog will have a sister and brother. LOL no I am not pregnant. I am launching 2 more blogs that have nothing to do with fitness but everything to do with lifestyle and business. Its scary, I am feeling the same way I felt when I launched gojenbefit excited and scared all at the same time. Both of these blogs will be tied to 2 business ventures and I am sooooooooooo stoked about this. I’ve been journaling, researching and taking courses so I am going to take the leap and do it. No worries tho you will be the first to know. Launch dates will be before June 2017. 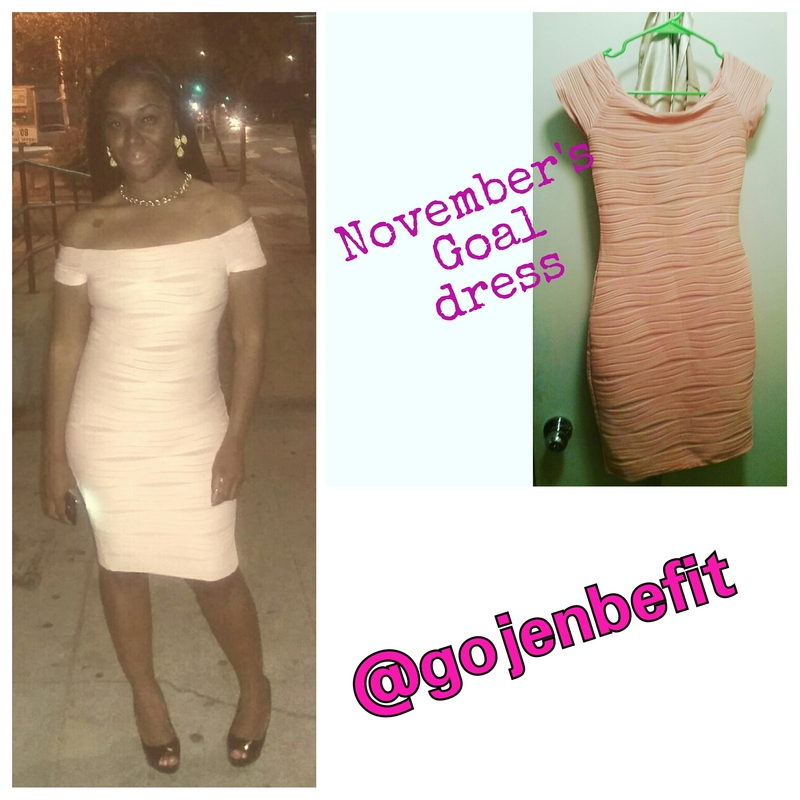 Upcoming events/things pertaining to gojenbefit. I am planning a bloggiversary brunch. I would like to celebrate the growth that has been happening on GJBF. All mygetfits are invited and I hope that you can make it. More details coming soon. Congrats on meeting your goal with being able to wear the dress, that is a big deal and no matter about the weight loss, you conquered something else, that is just as awesome! good for you – way to stay positive about it as well. I wish you well in your pitching to magazines/blogs, I think you will do well and learn plenty to share with many other bloggers. You seem to keep busy & achieving many things. Many wishes of continued success. Hahaha! Yes, it is a win-win, I think personally there is so much to learn about everything. I still don’t understand blogging all that much, but I just got with it and pretend I do, lol. I think people will be appreciative of the information you share, people like learning from other people’s triumphs and mistakes. It will be real and upfront and give people a new perspective. P.S I didn’t realize so much was outdated, I suppose that might be a good thing to know, I should pay better attention to things like that. Well I looked up ” how to do a picth or best ways to write a pitch” and those articles were bit outdated. But there info was good. The best info I gathered about how to write a pitch came from a YouTube video I stumbled upon from 8 months ago. I’m gonna do what they want and see what comes back ! Wow! Well, something someone said has to be still relevant, I would think… lol. If it gives you a general idea, that is helpful. I think you will do well! Yeah they had some good points. Follow editorial calendar. Have catchy title . keep pitch simple unless instructed otherwise. Useful. I don’t really know what I am doing so any information is helpful. But I’ll be sharing how it goes. Happy Bloggiversary! “Editorial calendar”, I have never even heard of that, lol. See.. I am already leaning something new from you! lmao. I wouldn’t be able to share anything, because I don’t yet know how to “pitch” , not anything that would be of use to anyone, which is why I refrain from sharing it, because I don’t want to lead anyone down a rabbit hole. I am still learning and still trying to figure out my voice in my writing 😀 so much goes into this lifestyle. Oh! wow! I never knew that about you. So this is nothing too new for you, just revisiting it. Yes, I do, but honestly, he probably takes it “easy” on me since I know nothing about writing for a magazine and the fact that he does, helps me. He teaches me things that I apply to the magazines I want to write for but I am stubborn and like doing what I like to do! xD I am learning to listen though. I think so many people have asked me how to get editors of magazines to notice you, etc. – but I never can answer, because I don’t know how to, I just do me, i just live and spend too much time on the computer during the week! lol. That’s what people want your way. The unconventional way. The behind your scenes way. I smell a blog post coming about this from you. Just dropping a bug in you ear. I think you have so much to offer to new writers who need a place to start. You won’t be promising they will get published just sharing what they MAY** can go about it. Lmao, hmm, maybe one in the future, when I feel much more accomplished, although I look forward to your new blog post that will be coming soon! Maybe when I see how you go about teaching people about your writing, etc, it will give me a motive to find my way of teaching people about writing. Ha! We will see. I’ll keep you posted. Have you applied for blog fest 2016 this year?? http://www.ideafit.com/fitness-conferences/blogfest/application-page you should apply went last year it was fun and it specific to fitness bloggers but all bloggers are welcomed to apply check it out.